The highlight of this year’s race was a Castrol coloured hatchback that was having trouble breaking for the single lane iron bridge (pictured here) that is the modern icon of the rally. My brother and I where standing behind the barrier that narrowed the road from two lanes to one. The Golf hit the barrier just to the right of us, hit the other side and then got wedged on a 90′ angle in the bridge (pictured here). The spectators where eventually allowed to go out and help push (pictured here) and after they worked out how force and levers work they where able to push the hatchback off the bridge and the stage was re-oppened (pictured here) . My Flickr gallery of the event can be found here and the video of car about to slide off the edge of a corner in the dark (and into a lake) can be found here. Steve Gibson, of Gibson Research (GRC) which brought us Sheilds Up and Spin Right, has created a password generator for WEP and WPA Keys. Itâ€™s tough to compete with a big name in security, but passnerd.com does offer passwords created on the userâ€™s end for stronger randomization. GRC offers SSL to get around this, but in theory (but never by Steve Gibson) someone could look at the passwords the server was sending â€“ but Iâ€™m sure Steve has one of the most secure servers on the net. All that said, there is this site: grcsucks.com. 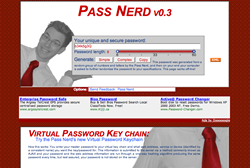 You still get a better password when you deal with the passnerd .com. The broader Anglican church is upset over the recent appointment of a gay bishop in the US and the marring of gays by a minister in BC. Also the UK may soon join the gay marriage club and the church is exploring what that will do to their spousal benefits, etc. In a letter to the Archbishop of Canterbury by almost half the world’s presiding archbishops suggested that the church “cut away dead branches that had failed to bear fruit”. A veiled reference to the BC and American dioceses. Is it just me or are these the only two dioceses that are bearing fruits? PassNerd.com is a web page that will generate a random password that is unique to you. Itâ€™s a quick way to get a password that you know is random (as opposed to mouse34, desk12 and appl33) and it canâ€™t be intercepted by hackers while in transit. Other features of the site are a virtual password keychain that uses AJAX (the latest WWW fad) and one-way password hashes to generate random passwords for every site on the internet that are unlocked by your one master password. RSS feeds of random passwords of various lengths (8 characters to 62) that can be syndicated to any site via XML. Create a cut nâ€™ paste code to have a random password added to your site. Write up a random password guarantee that covers how no computer can create truly random informationâ€¦ pseudo randomâ€¦untraceable, etc. Move the logo/look of the site towards just the tie and away from the web siteâ€™s current model. Working with talent is too tedious. I recently helped my brother get “his computer” up and running on someone else’s. Let me explain, his Hard Drive died (an unfortunate habit of 12′ Apple portables) but he did have a backup and even had a few moments to copy his most recent files as the machine died. Since he had access to another Mac he wanted to get “his computer” back on it. This isn’t too hard to do with the UNIX-base of OSX and the principles of UNIX file layout it follows. Boot up the ‘other’ Mac and create a new account with the same short name (ie. same folder name as your home). Launch the Terminal and type cd /Users to enter the Users directory with all the homes on that computer. Now you need to remove the folder your just created, so if your short name was Adam then you’d type rm sudo -rf Adam/, you will be prompted for the user’s password. Next you need to connect the external drive to your computer, take note of the drives name, if you’re not sure type ls /Volumes to check. To make a link to your old Mac’s home folder type sudo ln -s /Volmes/DriveName/Users/Adam and that should re-create the folder you just deleted as a link to the external drive. — That’s it, you’ve moved into this new machine. You are currently browsing the iMatt :: The Blog of Matt Clare weblog archives for November, 2005 .